Proximal row includes talus and calcaneus. Middle row is made of navicular. Distal row is composed of 3 cuneiforms (medial, intermediate, and lateral) and cuboid. Calcaneus (heel bone) is the largest and most proximal bone. Talus is the 2nd largest bone and is located above the calcaneus like a rider, therefore maximum bone in the skeleton of foot. Navicular is boat-shaped and is located in front of the head of talus. Cuboid is cubical in shape in front of the lateral part of calcaneum. Cuneiforms are small wedge-shaped bones and ordered from side to side in front of navicular. The talus is the 2nd largest bone of the foot situated on the upper surface of the anterior two-third of the calcaneus. It creates the attaching link between the bones of the foot and the leg. It participates in the formation of 3 joints- ankle (talocrural), talocalcaneal (subtalar), and talocalcaneonavicular (pretalar). Tal us is the only bone of the foot, that is devoid of any muscular connection. Its rounded head is directed forwards. Its trochlear articular surface (that is convex anteroposteriorly and concave from side to side) faces upward. Triangular articular surface on the side of body faces laterally while the comma-shaped articular surface on the side of body is directed medially. The talus presents a head, a neck, and a body. It’s directed forwards, medially, and somewhat downward. Its anterior surface presents a convex articular surface which articulates with the concavity of navicular bone. 1. Posterior facet is largest and articulates with the middle facet of calcaneus and creates a plane synovial subtalar joint. 2. Middle facet articulates with a spring ligament. 3. Anterolateral facet articulates with all the anterior facet of calcaneus. It’s a constriction between the head and the body. It projects forwards and medially from the body making an angle of 150 ° with the body (neck-body angle). Distal part of dorsal surface of neck gives connection to the dorsal talonavicular ligament. Lateral surface of the neck gives connection to the anterior talofibular ligament. Plantar surface of the neck presents a narrow deep groove termed sulcus tali which creates sinus tarsi with the corresponding groove of calcaneus. The body of talus is cuboidal in shape. It presents 5 surfaces- superior, inferior, medial, lateral, and posterior. Superior surface: It presents trochlear articular surface being wide anteriorly. It articulates with all the distal outermost layer of the tibia. Inferior surface: It presents a large oval concave facet which articulates together with the posterior facet of calcaneus to create the subtalar joint. Medial surface: Its upper part presents a comma-shaped articular facet which articulates together with the medial malleolus. Lateral surface: It presents a triangular articular facet to joint with lateral malleolus. Posterior surface: It’s narrow and projects backwards as the posterior process of talus. It presents an oblique groove limit by a small medial and large lateral tubercles. The groove lodges the tendon of flexor hallucis longus. Fracture neck of talus: It occasionally takes place because of strong dorsiflexion of foot. The arteries supplying the talus goes into via the front part of the neck and pass backwards. These arteries are damaged in the fracture neck of talus and cause delayed union or necrosis of the posterior section. The talus ossifies from 1 center which appears during the sixth month of intrauterine life. The calcaneus is the largest and strongest bone of the foot. It’s situated below the talus and goes behind it. It’s directed forwards and laterally with an upward inclination. Its narrow end bearing concavo-convex facet faces anteriorly. Its concave surface bearing shelf like projection faces medially. Surface bearing large convex articular facet faces dorsally. The calcaneum presents 6 surfaces- anterior, posterior, superior, plantar, lateral, and medial. It’s the smallest and bears a concavo-convex articular facet to joint with cuboid. Upper one-third is smooth and related to a synovial bursa. Middle one-third gives connection to tendocalca neus and plantaris. Lower one-third is subcutaneous and weight carriage during standing pose. Poster one-third is harsh and covered with pad of fibrofatty tissue deep to tendocalcaneus. Middle one-third bears a large oval facet- the posterior facet for talus. Anterior one-third more anteriorly presents 2 articular facets referred to as middle and anterior facets for talus. (a) Medial narrow part is grooved and termed sulcus calcanei, which gives connection to the interosseous talocalcanean ligament. It’s rough and marked by 3 tubercles. A small tubercle at the anterior end referred to as anterior tubercle. An elevation at its posterior end termed calcaneal tuberosity presenting a large medial and small lateral tubercles. Triangular area between the 3 tubercles gives connection to the long plantar ligament. A groove in front of the anterior tubercle supplies attachment to short plantar ligament. It’s virtually flat and subcutaneous. It presents a small elevation in its anterior part named peroneal trochlea (tubercle) which is located 2 cm below the tip of lateral malleolus. Peroneal trochlea is located between the groove for the tendon of peroneus brevis above and the groove for the tendon of peroneus longus below. It’s concave from above downward. A shelf like projection referred to as sustentaculum tali projects from its upper anterior part. Superior surface of sustentaculum tali bears a facet for talus while its inferior surface carries a groove for the tendon of flexor hallucis longus. Tendon of flexor digitorum longus is related to the medial surface of sustentaculum tali. A case from tibialis posterior tendon. Calcanean fracture: It takes place when someone falls on his cures from a large height. The calcaneum breaks into a number of bits and fracture lines generally run vertically. The navicular bone is boat-shaped. It’s flattened anteroposteriorly and presents 6 surfaces- anterior, posterior, dorsal, plantar, medial, and lateral. Anterior surface is convex and possesses 3 articular facets for 3 cuneiforms. The medial facet is the largest. Posterior surface is deeply concave and articulates with the head of talus. Dorsal surface is convex and rough, and gives connection to the dorsal talonavicular ligament. Plantar surface presents a groove in its medial part via which enters the tendon of tibialis posterior. Its lateral part gives connection to the spring ligament. Medial surface projects downward to create tuberosity of navicular bone, which gives insertion to the major part of the tendon of tibialis posterior. Lateral surface is rough and might present a facet for cuboid. Its deep concave surface faces posteriorly. A notable projection, the navicular tuberosity, is directed medially. A groove adjacent to tuberosity faces inferiorly. The cuboid bone as the particular name indicates is cuboid in shape. 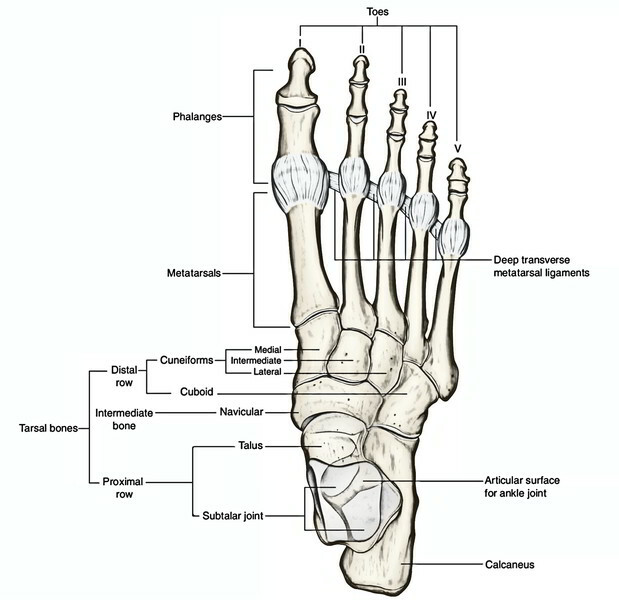 It’s situated in front of calcaneum and behind the fourth and fifth metatarsals. It presents 6 surfaces: anterior, posterior, dorsal, plantar, medial, and lateral. Anterior (distal) surface presents medial quadrangular and lateral triangular articular facets, which joint with the bases of fourth and fifth metatarsals, respectively. 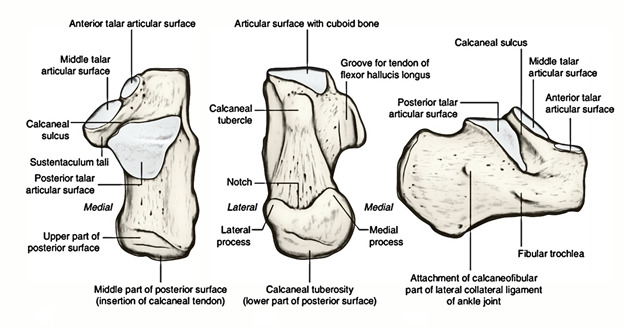 Posterior (proximal) surface presents a concavo-convex articulated facet (saddle-shaped articular facet) for articulation together with the anterior outermost layer of the calcaneum. Dorsal (superior) surface is rough and flat. It’s directed upward and laterally, and gives connection to dorsal ligaments of the foot. Plantar (inferior) surface presents an oblique groove in its distal part for the passage of tendon of peroneus longus. Medial surface presents 2 articular facets- a large distal oval facet and a small proximal oval facet which joint together with the navicular and lateral cuneiform bones, respectively. Lateral surface is small and grooved by the tendon of peroneus longus. These bones are wedge shaped and 3 in number- medial (first cuneiform), intermediate (second cuneiform), and lateral (third cuneiform). The medial cuneiform is the largest and the intermediate cuneiform is the smallest. Proximal surfaces of cuneiforms joint with all the navicular bone. Distal surface of medial cuneiform articulates with the base of first metatarsal. Distal surface of intermediate cuneiform articulates with the base of second metatarsal. Distal surface of lateral cuneiform articulates with the base of third metatarsal. The base of second metatarsal is the most given/ fastened because it fits into the mortise created by 3 cuneiforms. Because of this, the axial line of foot goes through the second toe and movements of abduction or adduction of toes are mentioned with reference to the 2nd toe.